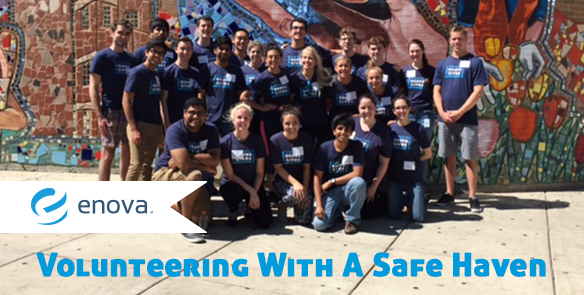 A Safe Haven: Intern Volunteer Event - Enova International, Inc. This past week, the Enova interns adventured off of Jackson Blvd and headed to A Safe Haven, a nonprofit providing transitional housing and so much more just a couple miles away from the office. We spent our afternoon learning how A Safe Haven helps the Chicagoland community. We were able to give back by painting the women’s and children’s floors of the residence commons at A Safe Haven’s center! When we first arrived, we were seated in the Chapel while an employee briefed us on the organization. Statistic after statistic, the Enova intern group learned just how vital A Safe Haven is to our community. Not only does it provide short term aid for homeless women, men, children and veterans in Chicago, A Safe Haven uses resources and training tools to provide long term solutions for the individuals involved with the organization. From culinary classes to landscape design courses — program participants leave living healthier lifestyles with jobs and plans for their futures. It was great to hear that Enova is one of their biggest supporters. As an intern, it feels great working at a company that supports nonprofits like A Safe Haven. During the next couple of hours, we split into groups and repainted the living quarters. We turned on some music, handed out paint brushes and divided into teams. Once one wall was completed, the interns who had finished their portion began helping the slower painters. We made the whites a bit whiter and the hallways a bit cleaner. I left A Safe Haven feeling great, for two reasons. Number one: I had spent the day with awesome people helping out at an organization that changes lives. I know that when families move into A Safe Haven, for however long that may be, they will walk through clean white hallways and feel respected. It may make their experiences a bit more enjoyable. Number two: it felt amazing representing Enova as we volunteered. I don’t know of another company that plans such frequent volunteer outings for its employees, and I think that speaks volumes about Enova and its core values. While it wasn’t the average ‘day at the office,’ I know we followed the same values out there as we would have in the office.